Union Bank of India Internet Banking facility available for all customers absolutely free of cost. Customers can use their smartphone/PC to access net banking facility. With net banking you can make fund transfer, check balance & statement, manage debit card, order cheque book and much more. Internet banking facility is completely safe if you take care of some security measures like change passwords regular, never tell your login details to anyone, never access your account in cyber cafe and beware of fake links that you received through mail. 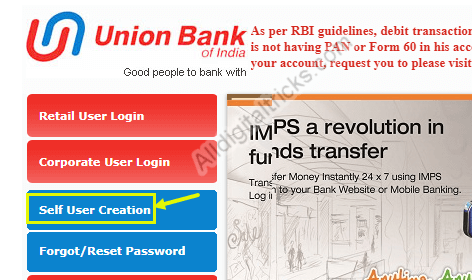 To use Internet Banking facility of Union Bank of India, you have to register for this and the good thing is this, can do this online, without visiting your bank branch. 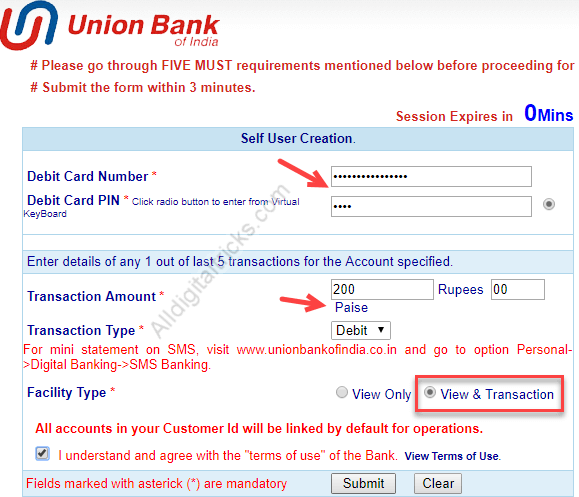 Here we are going to tell you – How to Register & activate Online for Union Bank of India Internet Banking facility. To activate Union Bank of India Internet banking facility online, you must have Debit Card with PIN. You will get your debit card while opening account. 1 First of all you have to visit https://www.unionbankonline.co.in/ and click on Self User Creation. 2 Now in the new window you will get 2 options, here you have to select Online Self User Creation – Users having Debit Card. 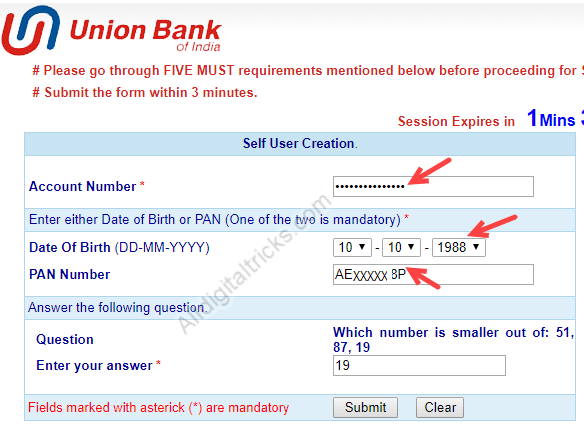 3 In the next screen you have to type your account number, PAN number, DOB then click on Submit. 4 Enter your Debit card number and PIN in the next screen. In Transaction Amount, enter last 5 any transaction amount and in Transaction type select credit/Debit option whatever you done. In the Facility type select “View & Transaction“. 5 Next screen type OTP that you will received on your registered mobile number. 6 On the next screen you can see your User ID and name. Click on continue. User ID is your customer ID which you can find on passbook. 7 Now you have to set your Login Password and Transaction password, after setting both passwords, submit it. That’s all you have successfully activated union bank of India net banking facility. Now wait 24 hours then you can login to your account.